I just looked at my Christmas wishlist and there is one book on it, which is Neil Gaiman’s The Sandman: Overture because yeah, like I’m NOT asking for that piece of literary majesty. Did anyone else’s Christmas list used to overflow with books and now they too are asking instead for a charcoal facial sponge and window film application toolkit? At first this worried me. Am I reading less? Do I like books less? Is my life starting down a path of bourgeois ordinariness that will end only when I bore myself to death? But NO. I have decided no to this. Ever since reading the first ten pages (I still haven’t gotten past those) of Marie Kondo’s The Life-Changing Magic of Tidying Up, I have been looking at my book “collection” (quotes to be explained in a moment) with a much more critical eye. Because, you see, owning a lot of books is in itself not a collection. Do you think the people on Hoarders look at their room of bedpans and call it a collection? Well, yes, they do, but they have a disease. A collection has some order to it, some discernment, some weeding out of unnecessaries. Did I need that thrift store copy of The Canterbury Tales that adds nothing aesthetically to my bookshelves and doesn’t even have end notes to explain what on earth is going on? Is it the only copy of The Canterbury Tales in existence, or even more, is The Canterbury Tales in any way difficult to obtain, thereby making me need this book? No, but there it was, with a smug look on its face, overconfident in its permanent spot on my shelf, sure I would never get rid of it, as when had I ever gotten rid of books since I was always convinced I might need them someday. On the other side was my copy of Gaudy Night by Dorothy L. Sayers. The 1944 copy that I bought for its font because it matched that of all the other Lord Peter Wimseys I’d checked out from my university’s library. I graduated before I got to Gaudy Night and it felt weirdly like a betrayal to read a Wimsey novel in another font. 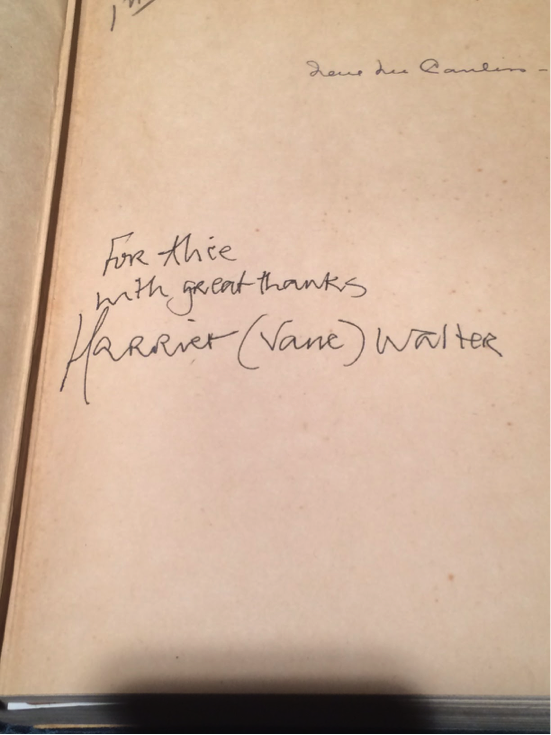 I subsequently got this copy signed by Harriet Walter, the actress who played the novel’s hero Harriet Vane in the television adaptation. Ever since Marie Kondo spoke of the freedom involved in ridding yourself of the excess in your life, and only surrounding yourself with items that make you feel joy, I have been on a mission. I will get through the 20+ library books I have checked out, and I will thin out my book collection until it is solely items that bring me joy or fill my soul with a feeling of connection to humanity. The latter is a feeling reserved for those books that might be difficult, and are a hard journey to get through, but for which you are so thankful when you are done. It’s not how many books you own. It’s owning books that mean something to you.